Online Poker in the USA and in Western Europe has certainly come into the maturity phase. While in some countries there is still a nice growth in the player base, the growth rates are not the same as they were around 2003 to 2007. But what about the state of the online poker industry in Arabic countries? And in which countries from the Arab world is playing Texas Hold’em particularly popular? We have tried to make this analysis and want to share the results with you. First of all, the term “Arab world” refers to Arabic-speaking countries. This adds up to an area of 21 countries in North Africa and in Western Asia. A total of 360 Million people live in those countries – more than in the USA and in Canada combined, which is quite amazing. 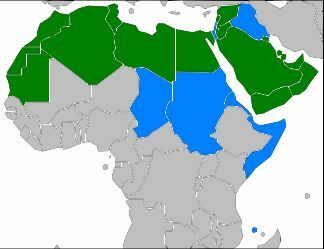 The above map (source: Wikipedia) shows where Arab is the official language (green) and where it is not the only official language (blue). Currently, many people living in Arab countries do not have a PC with a stable Internet connection yet. This means that online poker cannot be as popular as it is in Western Europe and in Northern America. Nevertheless, even the term “Texas Hold’em” is known in some of those countries. Let’s have a look in which Arabic countries online poker is comparatively popular. Online poker is most popular in Lebanon, followed by United Arab Emirates and Western Sahara. It is also played quite a lot in Qatar, Kuwait and Jordan. How we came to this conclusion? We have gathered the number of players in 2011 from the statistical website PokerTableRatings.com and placed that number in relation to the population in the specific country. We indexed the country with the most poker players per inhabitant (Lebanon) to 100. This is of course only an approximation, as the total number of players is still low and as PTR is only reporting figures for Party Poker and Full Tilt Poker. So if another poker room is more popular in one Arabic country there than in another one, the statistics are flawed. Another way to measure how popular a term is, is by typing it into Google Insights for Search. This is what we have done for a few selected countries. The result is a graph showing how relative interest in poker has developed in those specific Arabian countries. Since the end of 2006, interest in poker has been more or less stable in Egypt. Many searches included keywords such as “free”, “strip”, “facebook”, “zynga” or “play”. Therefore, it is safe to assume that online poker is popular in Egypt. As can be seen on the next chart, the interest in poker in Saudi Arabia is low. Otherwise, there wouldn’t be time frames where the interest was zero, such as in mid 2007. The highest interest in poker related searches was at the end of 2010, beginning of 2011. Among the most searched keywords, together with “poker”, were face, strip, online and Lady Gaga. Undoubtedly, her song was the reason for many of the poker related searches in Saudi Arabia. Many people with an Internet connection in Algeria speak French. So it is not a coincidence that some of the poker related searches were done in the French language, such as “gratuit” (free), “jeux de poker” (poker games) or “poker en ligne” (online poker). The same holds true for Morocco, where interest for poker strongly increased already in 2006, more than one year earlier than in Algeria. A similar picture can be drawn for interest in online poker for people from Tunisia. Online poker is rather popular in Kuwait. Other than in Egypt or in Saudi Arabia, there were plenty of people searching for “mobile poker” and even for “texas holdem”. This proves that the inhabitants of Kuwait show a huge interest in online gambling. The search pattern from people from the United Arab Emirates is very similar to the one of people from Kuwait. The bottom line is that while the total number of players from Arabian countries is still very low, the interest in online poker rooms from Arabians is rising.